The food industry has become very successful at developing irresistible, highly-palatable foods that seduce our taste buds. Because today's food has had its components taken apart, scientifically re-formulated, and put back together (with the addition of salt, sugar and fat into a "food-like" product), the majority of Americans have unknowingly turned into food addicts. As a result, the rates of obesity have skyrocketed; nearly 80% of Americans are now considered to be overweight. With so many popular diet books vying for notoriety, it's easy to become confused when choosing which diet approach is best. Most diet plans involve calorie or point counting, limiting portion size, utilizing an extremely strong will-power and following an intense exercise program. These approaches do result in weight loss, yet most people find themselves hungry (and grouchy) most of the time. Other plans are dangerous - resulting in significant health consequences. 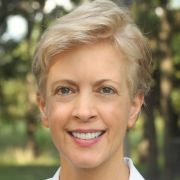 Consequently, most diets don't work because they don't (1) satisfy hunger and (2) don't address the root of the problem - which is food addiction (see our blogs) and micronutrient and fiber deficiency. Dustin Rudolph PharmD addresses how calorie counting doesn't work in his article Why You Should Stop Counting Calories To Achieve Long-Term, Permanent Weight Loss. "Our body was not made to starve itself" Rudolph says. "A look at long-term, calorie-restricted weight loss diets have shown that 80% of dieters fail to maintain their initial weight loss after one year, and 85% fail after five years on these diet plans. These diets are not designed for success, at least not in the long term." by Dr. John McDougall and illustrated on page 23 of his first book, The McDougall Plan. To understand the concept of nutrient density, it's important to note that the average stomach holds approximately 1 to 1-1/2 liters of food. Filling it with calorie-dilute foods (whole plant foods) instead of calorie-dense foods (meat, dairy, eggs, processed food, oils and juice/soda/alcohol) is the key to successful and permanent weight loss. Calorie-dilute foods are bulky, they are an excellent source of fiber and micronutrients, and they provide satiety with fewer calories. Using several glass beakers, Dr. McDougall demonstrates this calorie-dense vs calorie-dilute concept here. 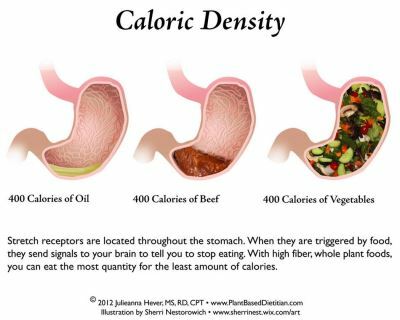 Similarly, the "Calorie Density" photo above provided by Julianna Hever illustrates how eating whole natural plant foods fills the stomach quickly and completely with only 400 calories. However, when 400 calories of oil, animal products or processed food is consumed, the majority of the stomach is still empty, leaving us hungry and grouchy! When artificial and calorie-dense foods are eaten, we are forced to overeat just to feel satisfied. As a result, in order to fill the stomach, a typical meal consisting of animal products, refined foods and oil can easily add up to 4,000+ calories. Jeff Novick discusses calorie density in greater detail here. How do Stretch Receptors and Nutrient Receptors Help us Lose Weight? Another key point to weight loss is highlighted in the video clip above from the powerful documentary Forks Over Knives. It explains that we experience satiety only when both the stretch receptors and nutrient receptors inside of our stomachs have been activated. These receptors gauge the amount and type of food that we eat. Stretch receptors in the stomach tell us that the bulk (volume) of the food that we ate is sufficient. When the stomach becomes full, these receptors send a signal to the brain telling the brain that the stomach is full. That's why fiber is so important. Fiber is found only in plant foods, animal products do not contain any fiber, and processed foods have had all or nearly all of the fiber removed. Fiber provides the bulkiness in whole natural plant foods. Notice in the video clip how 500 calories of oil or meat/processed foods barely fills the stomach and does not trigger or send any signals to the brain, so we continue to eat an enormous amount of calories in order to trigger these receptors. In contrast, 500 calories of whole plant foods fills the stomach completely, making it very difficult to overeat. The caloric (or nutrient) sensors in the stomach measure the caloric density and nutrient content of the food. Because nearly 90% of calories in the typical American diet come from animal products and processed food, Americans are severely deficient in micronutrients and fiber. These nutrients are found in whole plant foods and offer powerful protection against disease and weight loss. A diet rich in micronutrients suppresses our appetites and resolves food addictions by meeting our micronutrient needs. When our micronutrient needs are not fulfilled, our bodies will continue to feel hungry - so we keep on eating. It's our body's way of telling us that we haven't given it what it's looking for. Additionally, highly-palatable high-fat and sweet foods dulls our dopamine reward system which leaves us feeling unsatisfied even after we have eaten. According to Doug Lisle PhD, "The consumption of unnaturally dense food is the main cause of the obesity epidemic in America." The Forks Over Knives clip above briefly explains what Dr. Lisle refers to as The Pleasure Trap. His detailed presentation of how we can "lose weight without losing our mind" can be seen here. As you can see, a whole-food, plant-based diet not only aids in weight loss, it's an excellent way to support optimal health as well. (7) Which Foods are the Most Popular? (9) Don't Drink Your Calories! How do the Majority of Heart Attacks Occur? Is Coconut Oil a Super Food?